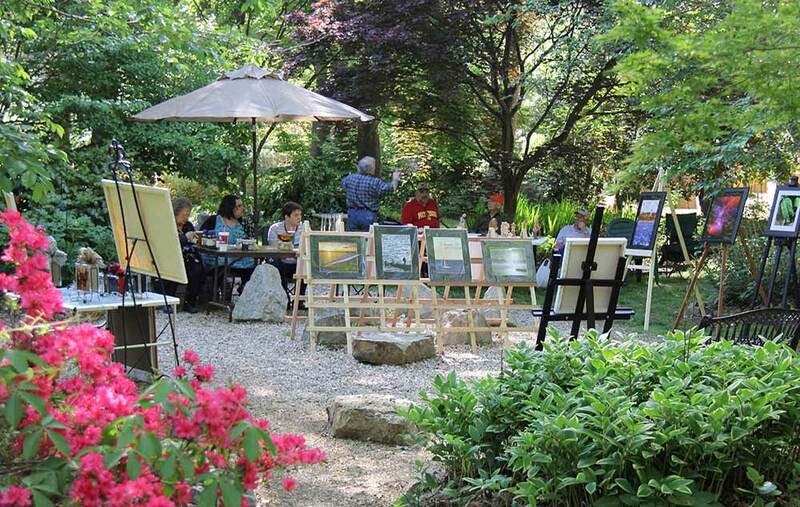 Area artists and artisans are invited to reserve booths for showing and selling their works at the 2018 Art in the Garden show set for Saturday, May 5, in Lendonwood Gardens in Grove. Deadline for booth reservations is Saturday, April 28. There is no fee for art exhibitors to participate in the show. A deposit of $25 reserves booth space and is reimbursable to artists who participate. Booths will be set up throughout the Gardens and are available by reservation on a first-come, first-served basis. Artists retain all proceeds from sales of their artworks. Art in the Garden will feature works by young school-age artists as well as professional artists and accomplished craftsmen. Participants typically include potters, wood-turners, quilters, jewelry-makers, sculptors and carvers, in addition to artists working with oils, watercolors and other media. During Art in the Garden, there will be no admission fee for the public to explore the eight-acre botanical garden and enjoy the displays of arts and crafts. Rain date for the event is Saturday, May 12. For visitors and artists who work up an appetite during the show, a food booth will be staffed by local Boy Scouts. Proceeds will be used to help fund the Scouts’ summer camp. Exhibitors interested in participating in Art in the Garden are asked to contact Lendonwood at 918-786-2938 for more information and to reserve booth space for the event.